Because.... we're having a candy buffet! and it's going to be the yummy kind. No color coordination, no excess decorations...just bunches of rainbow candy goodness. 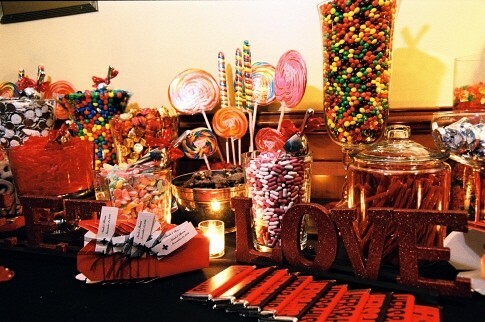 I had never heard of a candy buffet (or a candy bar, as I keep saying to everyone's confusion), until I entered the world of wedding blogging. Now I can't imagine my wedding without it! Last night, aunt jet and I made a mock set up before we pack up the containers for the attic. I'm running out of storage space! Here's a photo of the set up I'm planning at this point, though we may add a piece or two. Now, the best part, how much this set up is costing me....are you ready? 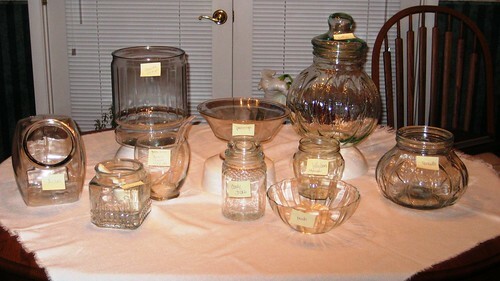 Every single piece on the table was purchased from a thrift store or borrowed from a relative. The total cost of all the containers is less than $50! 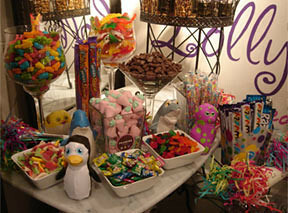 i definitely want a candy buffet! i love them! and 50 dollars is a great deal!! Great idea! 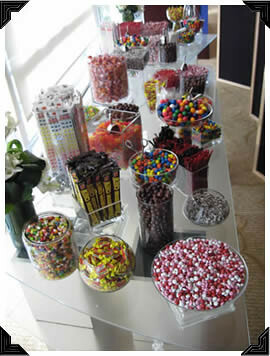 I hadn't heard of a candy bar(buffet) either until I started reading blogs! I have thought about it but I know I'd eat it all night long! Haha!! Who cares how popular they are, people LOVE them! :) I know my guests did, and they were all surprised. I highly recommend it. I really want to do a cookie buffet/spread to accompany our wedding cake. Finding all the right size and shape glass vessels might be challenge, but it really does look awesome in the end -- based on pictures I've seen! I am still deciding if I am having it to my wedding or not. They sure add some color to any party and you cannot deny they are yummmmmmmy!! That's such a great price! And I love that big one in the back! I love the idea of candy bars!!!! It's so colorful and fun looking!!! 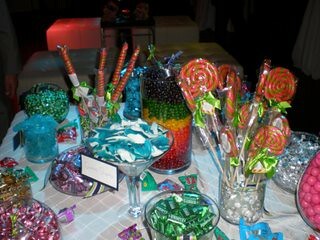 Candy Bar sounds Awesome!!! I'd love it as a guest!